Uptown San Diego is known for it’s amazing neighborhoods, ideal climate and communities that are full of life. Residents and families all sharing together in the non-stop entertainment, food, music, parks, and culture. One of the best parts of living in Uptown San Diego is the close-knit communities. The community newspaper, San Diego Uptown News, is the No.1 resource for information about the community. Every year the San Diego Uptown News announces the awards for the year’s Best of Uptown in the different categories of business and entertainment. The Readers vote to share their entertainment and business favorites such as the breakfast hotspot, finest chiropractic office, superior happy hour, ideal wine bar, most creative art gallery, romantic dining, greatest museum, favorite local bar, top florist and many more. Some of the winners have been serving Uptown customers for decades, while others just opened their doors and are already rising to the top of the list. This month’s Uptown News showcases the best of the best in the communities of Old Town, Missions Hills, Hillcrest, North Park, University Heights, Mission Valley, Normal Heights, Kensington, Talmadge, Bankers Hill, South Park and Golden Hill. Congratulations to all the Winners and thank you to everyone in the community who voted! 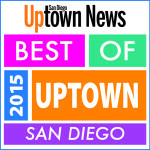 To learn more about the Uptown News Winners, please visit the SD Uptown News Digital Edition.